We’d love your help. Let us know what’s wrong with this preview of Christianity for the Rest of Us by Diana Butler Bass. For decades the accepted wisdom has been that America's mainline Protestant churches are in decline, eclipsed by evangelical mega-churches. Church and religion expert Diana Butler Bass wondered if this was true, and this book is the result of her extensive, three-year study of centrist and progressive churches across the country. Her surprising findings reveal just the opp For decades the accepted wisdom has been that America's mainline Protestant churches are in decline, eclipsed by evangelical mega-churches. Church and religion expert Diana Butler Bass wondered if this was true, and this book is the result of her extensive, three-year study of centrist and progressive churches across the country. Her surprising findings reveal just the opposite—that many of the churches are flourishing, and they are doing so without resorting to mimicking the mega-church, evangelical style. Christianity for the Rest of Us describes this phenomenon and offers a how-to approach for Protestants eager to remain faithful to their tradition while becoming a vital spiritual community. As Butler Bass delved into the rich spiritual life of various Episcopal, United Methodist, Disciples of Christ, Presbyterian, United Church of Christ, and Lutheran churches, certain consistent practices—such as hospitality, contemplation, diversity, justice, discernment, and worship—emerged as core expressions of congregations seeking to rediscover authentic Christian faith and witness today. To ask other readers questions about Christianity for the Rest of Us, please sign up. This book annoyed me. Maybe I'm just not the intended audience, but it rubbed me the wrong way all the way through. I read to about the halfway point, then skimmed to the end. It did get terribly repetitive, so I didn't appear to miss too much by skimming. Butler Bass starts off by talking about how she dislikes "self-absorbed and isolating" spirituality. This got me all excited, because I feel similarly. However, I couldn't help but feel that many of the congregations she profiles who supposedly This book annoyed me. Maybe I'm just not the intended audience, but it rubbed me the wrong way all the way through. I read to about the halfway point, then skimmed to the end. It did get terribly repetitive, so I didn't appear to miss too much by skimming. Butler Bass starts off by talking about how she dislikes "self-absorbed and isolating" spirituality. This got me all excited, because I feel similarly. However, I couldn't help but feel that many of the congregations she profiles who supposedly counter this tendency of mainline Protestant spirituality really were just more of the same, sometimes with a somewhat exotic twist, and as a rule more numerically successful than average. My feeling of alienation from the book and the people it profiles only grew as I read onward. While the book is about "liberal and progressive" churches, it could have been so without outright declaring "evangelicals" as the enemy. Throughout the book "evangelical" is used as a synonym for "bad" or "backwards" or--an issue that should be discussed more openly in "classless" America--"uncouth." You can be anything you want, just don't be "evangelical"--we don't do such things in polite company. Throughout the book, class conflict was an unspoken backdrop, never addressed to its face. As a girl raised in an evangelical Quaker church where working class 'burbs meet rural fields, I'm sensitive to this issue, and don't have the luxury of simply ignoring it. The apologetic Anne Lamott NPR Christians aren't just afraid of being seen as "intolerant" like those evangelical bugbears (in fact they are openly intolerant in their own ways). They are afraid of being seen as cheez-whiz eating, TV watching, unironic Jesus kitsch-sporting "trailer trash." The author of this book is fond of repeating, over and over again, lists of the kinds of people found in these liberal churches. "Black and white, straight and gay" in particular gets reiterated again and again. While diversity is certainly admirable, Butler Bass makes the usual "progressive" mistake and completely fetishizes it. It's almost like all an old Methodist or Lutheran church needs to revitalize itself is a token black family and a gay mascot. Butler Bass mourns the loss of the old neighborhoods and moral certainty she grew up with, but neither does she nor the people she profiles seem willing to compromise to regain such a thing. The "enemy" (those low-class conservative evangelicals) must be warded off at all costs. You get the impression that Jesus loves everyone, especially gays and "the homeless," except those embarrassing country cousins. Unironically at one point she points out that "moral purity" is out and that people just want "community" and "don't care what their neighbor is doing." Presumably she means to say that we don't care what our neighbor is doing in his bedroom, but does she not realize that you can't have COMMUNITY without "busybodies" who "care what their neighbor is doing" at SOME level at least? Moral continuity and community require at least some level of "judgementalism" to uphold agreed upon community standards. I also kept wondering as I read, where are the kids? Because it's great that you're winning converts, but most people eventually have kids. And if they don't feel comfortable there with their kids, the church will die, still, eventually, it will just take a little longer to get there. Many of these churches seemed either oblivious or downright hostile to the needs of children. There were lots of labyrinth walks and "Celtic harp music" (oh, rolling of my eyes) and "contemplative silence" and the word "genteel" was using approvingly quite frequently. But where are the kids supposed to go, in the midst of all this yuppy meditation time? So anyhow. What makes a dying mainline church come back to life? I was interested to know, because I'm currently looking for a new church after my young family was coldly and unceremoniously squeezed out of an ELCA Lutheran congregation we had called home. I felt increasingly pushed away by the number of sermons that were the pastor railing about politics (from a far left POV) and the disinterest in ministering to families with young kids as compared to the "educated young urban professional" crowd. I loved the traditional worship style but it felt colder and hollower every week, and the pastor was personally offended when I didn't jump for joy at her increasingly flamboyant embrace of moral relativism. The church is dying, and I wonder what could bring it back. According to Butler Bass, my old church was doing everything right. They were a "RIC" church, welcoming sexual minorities. (Loudly and obnoxiously at times.) They were traditional. (Traditional is good, apparently, while "exclusivist" or "conservative" are bad.) They even have "the homeless" attending worship. But still, they're going down fast. Apparently Butler Bass' arithmatic doesn't work for every church. There were parts of this book that I really enjoyed, and parts which really bothered me. By and large, I found myself agreeing with the author, if annoyed by some of the folks profiled. I guess it just feels like sometimes people tend to become very self-righteous when talking about what worship, or church community, or pastoral responsibility should or shouldn't look like, rather than traveling the journey that is theirs to travel with as much integrity as they can. If that makes sense. This Baltimore native did study on Pew Grant of mainline churches which were "making it," thriving, and not ultra-conservative mega churches. Very interesting insights, author very winsome in person, heard her speak last week and read book in advance. Thought provoking as well. While the popular media, both secular and religious, have long written off "Mainstream Protestant" denominations as dying, diminishing, and doomed, this book gives an alternative to this "conventional" thinking. Diana Butler Bass took a three-year pilgrimage exploring a number of vital mainline congregations throughout the United States. What she experienced led her to conclude that, in spite of being irrelevant, mainline Protestantism may indeed hold the essence of where the Church needs to be While the popular media, both secular and religious, have long written off "Mainstream Protestant" denominations as dying, diminishing, and doomed, this book gives an alternative to this "conventional" thinking. Diana Butler Bass took a three-year pilgrimage exploring a number of vital mainline congregations throughout the United States. What she experienced led her to conclude that, in spite of being irrelevant, mainline Protestantism may indeed hold the essence of where the Church needs to be going in order to reach a increasingly post-modern, secularized society where the more and more people are identifying themselves as "spiritual, not religious." These newly-vibrant, traditional Protestant congregations have embraced a variety of styles in a variety of places, but each of them have discovered an "ancient/future" approach that both upholds the traditions of their foundations as well as speaking authentically to the society around them. I found Bass' analysis insightful and inspiring. I recommend this book to anyone interested in exploring how to transform and enlivening Christian community while still maintaining the center of what is important for the faith. The common point of view these days is that the so-called "mainline churches" are losing members. Along with this is the assumption that they are doomed, and that only more conservative evangelical churches are growing. Diana Butler Bass offers a different perspective in her book that shares experiences discovered in a study supported by the Lilly Endowment. While it is true mainline congregations are having a difficult time, it is too soon to write an Obituary. Butler Bass studied ten mainline c The common point of view these days is that the so-called "mainline churches" are losing members. Along with this is the assumption that they are doomed, and that only more conservative evangelical churches are growing. Diana Butler Bass offers a different perspective in her book that shares experiences discovered in a study supported by the Lilly Endowment. While it is true mainline congregations are having a difficult time, it is too soon to write an Obituary. Butler Bass studied ten mainline congregations that are growing and thriving. She shares ten practices that characterize these faith communities (hospitality, discernment, healing, contemplation, testimony, diversity, justice, worship, reflection, beauty) You may consider these to be signs of renewal. Some call this her best book-I haven't read her others- but I found this to be easy to read. Our Book Club just finished it. Our congregation is in transition at the present time. This was a helpful book that offers an interesting look at congregations from all regions of the United States. The so-called "mainline church" seems alive and well in these congregations. First it must be noted that the research and data used in this book may be dated now as this was published in 2006. However, the basic premise left me encouraged about finding a relevant worship experience in future mainline Protestant churches. Many will continue to decline and die but the churches Bass writes about are growing and thriving and providing an avenue for spiritual growth and transformation of both individuals and communities. The world is not in a cosmic battle between good and evil. The republican platform is not an interpretation of scripture. “By defining politics as winning, often in terms like destroying the enemy and defeating Satan they rightfully frighten people away from any talk of Christians in politics.” We need discussion, discernment, debate, and compromise. Excellent analysis of contemporary mainline churches that have adapted to the changing needs of congregations who are questioning the business-as-usual mid-20th century approach to Protestantism in the US. This is such a good and important book. It's been out a few years now and is about mainline churches, but I find in compelling now even for someone like me who is not part of the mainline tradition. Anyone who cares about church would find this interesting. Great discussion on how to keep mainline Protestantism vibrant in a changing world. This is non-fiction, but a very interesting analysis. 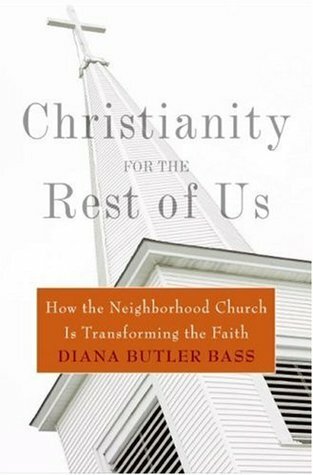 In Christianity for the Rest of Us Diana Butler Bass journeys through the mainline churches in the United States for a research project on the spiritually vitality of those churches. Bass spent her childhood in a Methodist church until her family moved out west in her teen-age years. From that point on until later adulthood she was a part of the Evangelical church. This project came about because she noticed, once she came back to her mainline roots, that the Evangelical churches were getting al In Christianity for the Rest of Us Diana Butler Bass journeys through the mainline churches in the United States for a research project on the spiritually vitality of those churches. Bass spent her childhood in a Methodist church until her family moved out west in her teen-age years. From that point on until later adulthood she was a part of the Evangelical church. This project came about because she noticed, once she came back to her mainline roots, that the Evangelical churches were getting all the press and number of members while the mainlines were dwindling. She wanted to see if the statistics were true and if the mainline churches were not showing signs of spiritual vitality. Needless to say she did find mainline churches throughout the U.S. that were showing signs of life. Her book focuses intently on ten specific congregations with another forty providing support for her findings. Within these churches she found ten signposts of renewal: hospitality, discernment, healing, contemplation, testimony, diversity, justice, worship, reflection, and beauty. Not all of the churches showed equal amounts of these traits, but overall these were the traits that popped up on her project. Bass does well in showing that the mainline churches still play a huge part of Christianity here in the United States, but no one really notices because all the media attention is gobbled up by Evangelicals. Bass though leaves the feeling that she has disdain for the Evangelical church with the way she describes them. Something that will not help in ecumenical outreach within the Protestant traditions in the U.S. This book has some worthwhile insights, and will be useful for my congregation to consider. However, there were some aspects of the book that rubbed me the wrong way. It is very much a white church book, speaking to white church people. Yes, some of the churches discussed have racial diversity, but the author spent much more time discussing political diversity than racial diversity. Her approach to political diversity was very centrist, a sort of "good church people can be either Republican or De This book has some worthwhile insights, and will be useful for my congregation to consider. However, there were some aspects of the book that rubbed me the wrong way. It is very much a white church book, speaking to white church people. Yes, some of the churches discussed have racial diversity, but the author spent much more time discussing political diversity than racial diversity. Her approach to political diversity was very centrist, a sort of "good church people can be either Republican or Democratic" view - and, in the end, leans toward advocating a political centrism that I find empty and spineless. I agree with her that linking Christian faithfulness to a party platform is wrongheaded, but centrism is not the better way. And finally, there is an offhanded comment midway through the book where she derisively mentions an Episcopal priest who brought some kind of paganism or earth spirituality into his congregation. I found her dismissal of that as obviously too far - openness run amuck - to be evidence of her own shallowness and prejudice. The introduction didn't really grab my attention but I kept reading. I got the sense that the author, Diana Bass was trying to establish her credentials as a pastor and an author. I guess the part about her "being qualified" to write about the subject was a bit off-putting. I could relate to Chapter one: Vanished Village and how the author Diana Butler Bass experiences and description of the church she grew up in and its decline. It was very interesting how each of the congregations she got to The introduction didn't really grab my attention but I kept reading. I got the sense that the author, Diana Bass was trying to establish her credentials as a pastor and an author. I guess the part about her "being qualified" to write about the subject was a bit off-putting. It was very interesting how each of the congregations she got to know and wrote about were distinct and different. Churches from various denominations (Presbyterian being one of several) that were able to independently develop faith communities. Each seemed to have its own spiritual emphasis which helped connect the church and its members to Christian heritage. It was also refreshing to see the inclusivity exhibited by each church. 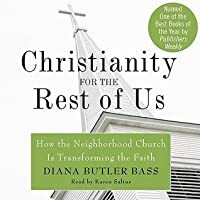 Even though it was a brief part in the book, I thought she hit the nail on the head with her observation that in each case, it was the local church and not it's larger national denominational body that was making the difference in terms of establishing a growing community. While contrasting the "liberal" Christian Church identities with the conservative christian counterparts, I would have liked to read how Bass' contrast of what a "liberal" church means compared with secular liberalism in politics. At any rate, the book was worth reading. While reading the book, I was thankful that I was able to be a member of a church that also established a missional identity that has attracted people of many ages. If you are looking for a prescription for vital Christianity based on a study of Scripture, you will be disappointed in Christianity for the Rest of Us. This book is the result of a study, or pilgrimage as the author calls it, to refute critics who say that only conservative churches can grow. She knew that "other" Christians existed and set out to discover them and learn the characteristics of those mainline Protestant churches that are thriving. The study was a serious, three-year study, the numerical results of which are tabulated in an appendix that would be expected in an academic study. It included additional visits to churches to verify her initial conclusions. She found ten characteristics in these vital churches, which she has termed hospitality, discernment, healing, contemplation, testimony, diversity, justice, worship, reflection, and beauty. She devotes a chapter to each of these characteristics, explaining their meaning by giving examples of what she found in specific churches. Not all of the vital churches demonstrated all ten characteristics. The churches themselves presented a diversity. All of the churches exhibited "the same spiritual triad: connection to tradition, commitment to Christian practices, and concern to live God's dream. Together, tradition, practice, and wisdom embody the Christian life." A theory-meets-practice book about how to run churches that are more about communities than about institutions. There's an inspiring passage about serving those in need, including homeless people in church activities, and making visible public statements about it. Some chapters explain specific traditions, virtues, or practices - like discernment or testimony - as the author understands them in light of her liberal Christianity. The book opens with an anecdote where she felt anxious during a mome A theory-meets-practice book about how to run churches that are more about communities than about institutions. There's an inspiring passage about serving those in need, including homeless people in church activities, and making visible public statements about it. Some chapters explain specific traditions, virtues, or practices - like discernment or testimony - as the author understands them in light of her liberal Christianity. The book opens with an anecdote where she felt anxious during a moment of silent reflection in church and wanted something more other-directed. However, later in the book she does recognize the power of silence and centeredness. First, this wasn't my choice of a read, it was picked for my group. Its was entertaining to read Bass sharing all her experiences in the various churches along her pilgrimage. But in the end I was hoping she'd give a bit of an outline, maybe, on programs, or outreach that she'd suggest for the New Emerging revitalized church to put into practice. I could identify with a few of the church goers, and to some degree I think my congregation is doing some of this stuff, to attract the pilgrims in our First, this wasn't my choice of a read, it was picked for my group. I read Christianity for the Rest of Us as part of an ecumenical discussion with the Book Buddies. (You can see our discussion here.) I think the arguments made in the book could be tighter, but I enjoyed the thoughts that they generated in me as well as the discussion. I'll be thinking about spiritual practices and the transformation of self and community for a long time. A challenging book on how moderate to liberal Christians can be the church and grow the church without trying "the next big thing" or sacrificing their faithful beliefs. I will say that I lament Bass's tendency to equate fundamentalists and evangelicals. I and many I know count ourselves as moderate to liberal Christians and evangelicals at the same time. I want "evangelical" to be reclaimed from the political polemic it currently is being crushed by and she doesn't help with that. A great book for mainline churches that want to grow and are encouraged by other mainline churches growing. It shows how Mainline Protestant churches can flourish without becoming evangelical mega churches. I believe this church could make a difference in the life of our church and with our new pastor, I believe it will! Looking forward to growing our church into the nurturing home for so many more! Praise and Worship! Interesting book about so-called mainstream "legacy" churches competing in the age of "Big-Box" mega-churches. MB met author at a book signing in Calgary. Similar scenarios to growth of Big Box Book Stores versus Little "Mom & Pop" Book Stores. Her book contains wise advice for historic traditional little churches on street corners and how they can re-brand themselves to become relevant again. I couldn't stop talking about Christianity for the Rest of Us, a look at the ways the mainline church is flourishing. The author spent 3 years interviewing and attending Protestant churches, which resulted in a very hopeful, encouraging look at the state of the church- one that often counters the evangelical opinion. I especially appreciated hearing more about core practices and the history of the mainline church. Very helpful as I begin my own foray into a mainline congregation. Thus study of thriving, Spirit-filled mainline, liberal Protestant churches was thrilling, at least as thrilling as a sociological study can be. It was a celebration of Emergent churches and their common characteristics. They distinguished Spirit-filled congregations and those wherein the pastor was enthusiastic but the congregation not on board, as well as those churches doing business as usual. Useful to see where our church lines up, what might be a joyous expression for us. Diana Butler Bass is an author, speaker, and independent scholar specializing in American religion and culture. She holds a PhD in religious studies from Duke University and is the author of seven books, including the bestselling Christianity for the Rest of Us, released by HarperOne in 2006. It was named as one of the best religion books of the year by Publishers Weekly and Christian Century, won Diana Butler Bass is an author, speaker, and independent scholar specializing in American religion and culture. She holds a PhD in religious studies from Duke University and is the author of seven books, including the bestselling Christianity for the Rest of Us, released by HarperOne in 2006. It was named as one of the best religion books of the year by Publishers Weekly and Christian Century, won the Book of the Year Award from the Academy of Parish Clergy, and was featured in a cover story in USA Today. Her much-anticipated next book, A People's History of Christianity, will be released in March 2009 from HarperOne. She is currently Senior Fellow at the Cathedral College of the Washington National Cathedral in Washington, D.C. Bass regularly consults with religious organizations, leads conferences for religious leaders, and teaches and preaches in a variety of venues.